Oct. 2, 2010 St. Croix, Virgin Islands--The idea of heading for the beach on a Saturday morning for your workout is not so unusual. The annual V.I.Pace Runners CoastWeeks Beach Relay takes the idea to another level. The event is for runners of all levels who form teams of two and complete two miles which are run entirely on the beach. This year the event is just a week after the 27th Annual Fort-To-For Run For Respect Relay. Saturday’s race drew thirteen teems mostly of school runners who go into cross-country on Wednesday. The St.Croix Track Club team of Ian Cuffy and Malique Smith won the race on Saturday at Ha Penny Beach with a time of 25 minutes and 8 seconds. Their victory was almost a repeat of last week when their team passed V.I.Pace to win. The V.I.Pace Runners team of Billy Bohlke and Ira Phillips was second in 25:49 and the Barracudas Track Club team of David Walter and Lenroy George was third in 26:37. Medals went to top teams and certificates were presented to all participants. The Beach Relay organized by V.I.Pace Runners is in cooperation with the annual International Coastal Cleanup week organized by the Ocean Conservancy. The next race on the V.I.Pace Runners calendar is The 4-H/V.I.Pace Runners Cross-Country Series at the University of the Virgin Islands on Wednesday at 3pm. Children run 1 mile, Junior Varsity runs 2 miles and varsity and open runners run 3.1 miles in separate races. On Saturday is the West Indies Lab 5 Mile road race at 6am on the East End Road at the St. Croix Yacht Club. St.Croix, Virgin Islands 10-5-08 The St.Croix Educational Complex/Junior Barracudas team of Justin Hitesman and Seymour Walters was seriously challenged by the St.Croix Central High School/Caribs team of Raibin Quinterio and Alexshendro Rodriquez in the race consisting of two runners per team who run the distance of St.Croix’s Ha Penny Beach out-and-back for a total of two miles. Quinterio led the way for the first leg of the race, covering the distance in 12 minutes 55 seconds. Rodriquez was caught by Walters, the top high school distance runners in the Virgin Islands with less than 200m to go to win the event in 25:02. Walters ran the two miles in 11:34. CHS was second in 28:00. The Jr. Barracudas team of Emanuel Encarnacion 14:02) and Clint Smith (14:32) was third in 28:34; Juan Rivera (15:53) and Justin Rivera 15:01) were fourth in 30:54; Jnuru Goodwin (15:03) and Leonardo Cruz (15:57) was fifth in 31:00; Rakeem Gumbs 15:10) and Dornel Walters (16:00) CHS was sixth in 31:10; Barrymore Bereley (16:00) and Dadesha Miller (24:10) CHS was seventh in 40:30. The CoastWeeks event, which charges no entry fee, was part of the International Coastal Cleanup week organized by the Ocean Conservancy. Participants in the beach relay annually pick up debris and trash on the beach, record what they pick up and submit the data for analysis. "Many of us recall how badly trashed the beach and surrounding area was when we held the first race here years ago," said Wallace Williams, event organizer. "When Barbara Taylor, a former top local runner and triathlete, introduced the Ocean Conservancy project, we took to it. The first time we had two truckloads of trash. Thanks to improved public response to help clean up our beaches and a greater sense of respect for our beautiful environment, today there was relatively minimal trash!" Juan Robles takes first place. 10-7-2006 -- Consider the annual CoastWeeks Beach Relay Race a reprieve from tough cross-country practices for high school runners and a diversion from road running and marathon training for the winter races. Water lapped the shores of Ha' Penny Beach as 21 teams with two runners each competed for the top three sets of medals. Hansel Estephan challenged Jose Reyes for the first mile, but Reyes and Juan Robles of St. Croix Central High School took first place in 25 minutes and 27 seconds. Keith Smith, former Olympian and Pan Am Games bronze medalist, and now coach of the St. Croix Track Club, teamed with Ian Cuffy to take second place in 29:07. Leeward Islands Championships medalists Lester Liburd and Calvin Dascent of the Barracudas Track Club took third place in 29:16. Up-and-coming sprinter Makiesh Taylor and the top distance runner so far this year, Ninfa Barnard of the St. Croix Track Club, took the first-place medals for females with a time of 32:17. Erica Sweitzer and Theresa Harper -- who had already run eight miles before the beach run, as Harper is preparing for next month's Philadelphia Marathon -- took second place in 36:25. Mirelle Smith, also a St. Croix Track Club coach, and Karissa Cave took third place in 42:07. The runners get busy next week with the V.I. Pace Runners/4-H Club Cross-Country Series to run at the University of the Virgin Islands' St. Croix Campus. This year's interscholastic teams will compete for the school championships, as well as V.I. Track and Field Federation Cross-Country Championships, in a four-race series scheduled for Oct. 11, 18 and 25 and Nov. 11. "Many of us recall how badly trashed the beach and surrounding area was when we held the first race here years ago," said Wallace Williams, event organizer. "When Barbara Taylor, a former top local runner and triathlete, introduced the Ocean Conservancy project, we took to it. The first time we had two truckloads of trash. Thanks to improved public response to help clean up our beaches and a greater sense of respect for our beautiful environment, today there was no trash!" 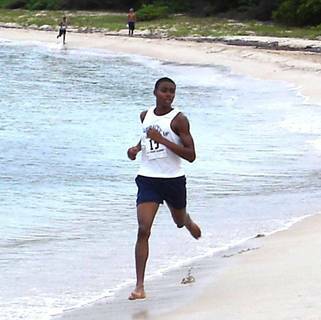 10-8-05 St. Croix, Virgin Islands--The Annual Virgin Islands Pace Runners CoastWeeks Beach Relay at Ha Penny Beach in St. Croix was won by the two fastest distance runners in the territory in veteran George Jules and premier high school runner, Juan Robles of St. Croix Central High School. Eleven teams of two were at the starting line on one of St. Croix’s most popular beaches. Jules was the lead-off runner and posted a time of 12 minutes and 23 seconds for first two miles; Robles carried the team to victory with a 11:17 second leg, their winning time was 23:40. The St. Croix Central High School had four teams in the race with the team of Cesar Tapia and Leonardo Reyes taking second place with a time of 28:39; the third place team and the first mixed team was Keith Smith and Mirelle Smith with a time of 29:08. 1.George Jules/Juan Robles, V.I.Pace Runners 23:40; 2. Cesar Tapia/Leonardo Reyes, St.Croix Central High School (CHS), 28:39; 3. Keith Smith/Miereilles Smith, Burnley Dragons 29:08; 4. Colin Daugherty/Rachel Witty, Trio We 30:30; 5. Earthla Augustin/Errol Chichester, Guavaberry 32:06; 6. Cid Bennie Ayala/Jochebed Harris, CHS 32:58; 7. Casmona Robinson/Leonard Reyes, CHS 33:25; 8. Larry Williams/Stuart Ketchum, Broken Wheels 35:26; 9. Shelly Matherne/Marie Elise Witmer, Hope In Motion 38:02; 10. Edmondo Octaviani/Jack Branch, Evening Runners 39:18 No time Jose Ramirez/Lisandro CHS? The next event on the V.I. Pace Runners Calendar is the 4-H Cross-Country Series (race #1) on Wednesday October 12, 4pm UVI St.Croix Campus. 1 mile elementary, 2 miles jv 3.1 miles varsity and open. 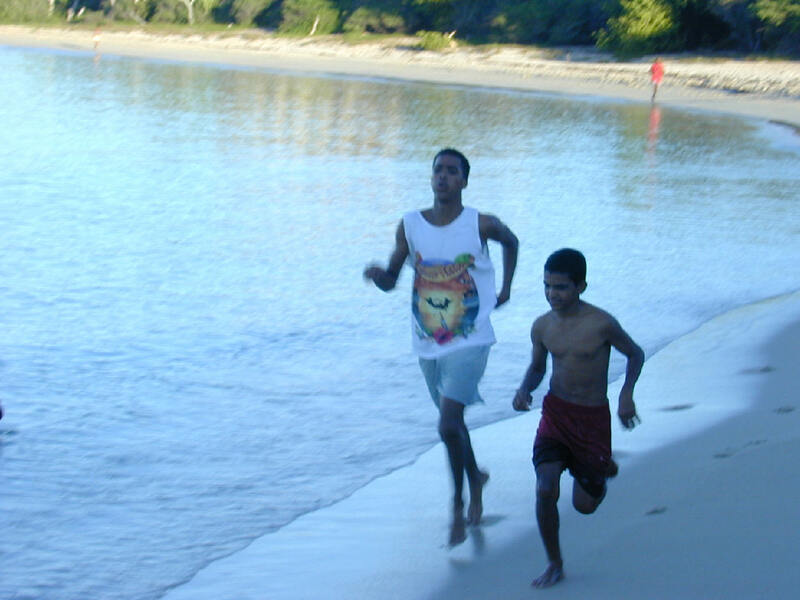 10/9/04 St.Croix, V.I.--Juan Robles, St.Croix Central High School, held off the challenge of veteran long distance runner George Jules in the first 2 mile leg of the CoastWeeks Beach Relay Race at Ha Penny Beach in St. Croix to lead his two-man team to first place in the event for the second year in a row. His partner, Hansel Estephan, St. Croix Educational Complex High School, widen the gap in the second leg over nine teams. Their time was 24 minutes and 26 seconds. The Educational Complex High School Boys team of Gilbert Petrus and Lester Liburd moved into second place on Liburd’s leg to secure that place with a time of 26:34. George Jules and Earthla Arthur, the St. Lucia Connection was the first place mixed male/female team in 27:41. John Harper and Theresa Harper, Harper Harriers finished fourth in 28:14; Gabe Weber and Tish Dusich, Tishilicious was fifth in 30:02; Bruce Daugherty and Errol Chichester, Eggshells was sixth in 32:26; Makiesh Taylor and Sanny Eugene, St. Croix Educational Complex High School Girls was seventh in 33:14; Terry Chretin and Mike Dance, Bodyworks was eighth in 33:49 and Louise Stapleton and Stuart Ketchum, Last Train to Boston was ninth in 35:23. 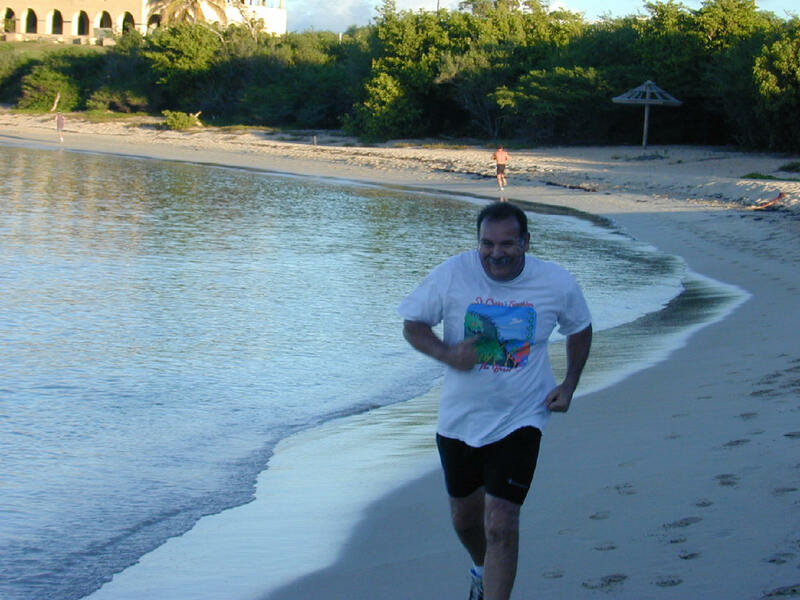 10/4/03 St.Croix, Virgin Islands--The Annual Virgin Islands Pace/Coastweeks Beach Relay race for runners on one of St. Croix most beautiful beaches, drew seventeen teams of two for this annual Saturday morning race at sunrise. Leading the way and taking first place overall were thirteen year old Estapan Hansel and 14 year old Juan Robles, both of John H. Woodson Junior High School (Robles graduated last school year and is now a freshman at St.Croix Central High School). Just twenty seconds behind and in second place was Troyson Raymond and Daniel Jerrif of Central High School with a time of 25:15. Right on their heels and third place overall and the first place mixed male/female team, were Earthla Arthur and Billy Bohlke with a time of 25:38. Bohlke, the top middle distance runner in the Virgin Islands and just this week completing his Air Force training and earning a commission as a 2 Lt., led the group all the way with a 11:05 for his two mile leg up and down the beach. Letitia Dusich and Rachel Witty were the first place female team with a time of 27:32. This event is part of the Annual International Coastal Cleanup project under the international coordination of The Center for Marine Conservation, Ocean Conservancy. The next race on the V.I. Pace Calendar is the 4H Cross-Country Series on Wednesday October 8 at 4pm at UVI St. Croix Campus. The race is the first of four races in the series and will feature 1 mile for elementary boys and girls, 2 miles for junior varsity boys and girls and 3.1 miles for varsity boys and girls and open runners. For more information call the Virgin Islands Pace Runners 340-777-0258 or logon to: http://virginislandspace.org for an entry form. St.Croix, V.I. October 13, 2002--Eighteen teams of two runners each, the largest total ever, took part in the annual V.I.Pace Runners Coastweeks Beach Relay race on Saturday morning at Ha Penny Beach in St. Croix. Amalie Lockhart and Kewoon Steele of the St. Croix Education Complex High School, won the race which consists of two legs of two miles each on one St. Croix’s longest beaches. Their combined time was 26 minutes and 8 seconds. Second place went to Chad Sufrin and Davian Quinland or St. Croix Central High School in 28:31; Jo Shim and Billy Bohlke took first place in the mixed category and third place overall in 28:38; John Harper and Theresa Harper were second in the mixed category and fourth overall in 31:08; Andrew Petersen and Rayford was fifth in 32:59. The Coastweeks Beach Relay is part of the national Coastweeks effort. 10-14-01 St.Croix, V.I.--The husband and wife team Theresa and John Harper finished first overall in the annual Coastweeks Beach Relay race on Saturday morning at Ha Penny Beach in St. Croix. Their time was 31 minutes 50 seconds. The other teams: Alicia Lewitt and Jay Wiltshire was second in 33:030; Jo Shim and Isaac Causey was third in 35:59; Cathy Vanderleest and Larry Vanderleest was fourth in 38:50 and Winston Berkley and Paul Prevost was fifth in 44:31. The Annual Coastweeks Beach Relay saw two teams this year with husband and wife Theresa and John Harper taking the honors with a combined time of 32 minutes and 43 seconds for the 2 x 2 mile relay on one of St.Croix's most beautiful beaches. Marie Elise Witmer and Cathy Prince took second in 42 minutes and 26 seconds. Following the race, participants picked up trash on the beach. It was noted that this year was the cleanest that the beach has been in years, only a few bags were filled.